Apologies if this has already been discussed. I am hoping to create a Luftwaffe Field Division impression. I am looking for help in relation to where to get the appropriate tunic. I want the Luftwaffe tunic not a heer tunic. If anyone can help, i'd appreciate your help. All advice welcome, insignia etc... I wish to portray an Officer (Hauptman). In the field you want a flieger blouse, with red tabs. do you have a supplier you could recommend i get the flieger blouse from? i have seen a few but i'm not sure who has the best quality. Welcome. Yes as mentioned, a Fliegerbluse would be correct. Where are you located? UK, US??? That would help in recommending vendors. 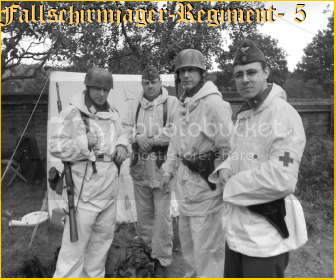 Have you chosen a particular time period or unit to portray or just generic Felddivision? BTW...SplinterB......Why do you suggest red collar tabs and not green? I can't really recommend an officer quality flieger bluse or 4 pocket tunic ( the Sturm ones are ok for other ranks and nco's), but would definitely recommend the Panther Store splinter B field division jacket - splendid kit! Hope this helps. i think jager is the way to go for me. where does one get the Sturm and Panther kit? I'm very new to the whole LWFD scene so i am looking for ideas re what to portray also. SplinterB any ideas re what to portray? Epic and Richard Underwood do indeed sell the Sturm fliegerbluse - I've got one badged up for my kriegsberichter impression (with golden brown signals collar tabs from Historical Militaria). Some of the guys on the forum recommend that the sturm bluse needs tailoring as it's supposed to be cut very close to the body. I'm lucky that I haven't needed to have this done. On another note, are you joining a group or starting up on your own? I've always thought the FD are great to portray, as they are about as un-elite as you can get! but dont know of any other dealers that do LW-FD smocks? he doesn't do them?, only Para smocks??? I have one of the dark background jackets - a great piece of kit. Green tabs so? Yes the LWFD are very interesting and no at all "elite" which appeals to me. would a Luftwaffe Tuchrock with Green tabs be a no-no?